Why should you order from The Flower Card Company? We understand the industry. With over sixteen years’ experience, we regularly talk to our customers about what they would like to see added to the range. We look at current trends and then Caroline sketches and paints the images, ready to be printed. With a wide selection of over 300 designs that include Birthday, Anniversary, Christmas, Valentines, Mother’s Day, Thank You, Just to say, With Love and image only cards. These fit neatly into our counter top card stands priced at £40 each. The card stand displaying our beautiful little cards are often placed near the till point to encourage an extra impulse buy. 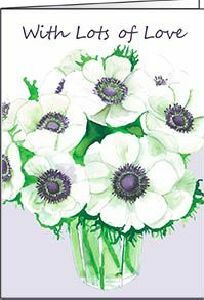 The Flower Card Company also sells white envelopes to fit the cards at £8.90 per 500. The small folding cards are perfect to write that personal message, measuring just 91cm x 64 cm. Card packs are competitively priced at £3.40 for a pack of fifty, they are a great add on sale at a recommended retail price of £1.20 each card. 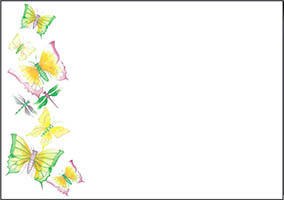 The Flower Card Company Ltd is the UKs leading company in Keepsake Cards, trading now for sixteen years with many regular customers that have been buying from us since day one. Our customers tend to stay with us once they’ve placed their first order. Caroline says ‘our customers give us such lovely feedback, and love the quality of our product’. There is no minimum card order, and delivery is fast. Caroline tells us that her friendly staff are on hand to answer any questions you may have, and are happy to take orders by phone, or using our website. Short stay Holiday Homes and Hotels use our cards as a thoughtful touch to welcome their guests. The cards are placed with an individual message from the manager or rental owner. The cards tend to be kept by visitors as a memory of their stay. Sherry from Trimleys Guest house says: ‘We like to place the cards propped up on the coffee & tea tray, the cards add that something extra to customers letting them know we go that extra mile. We often use the Champagne bottle with ‘Congratulations’ for Wedding couples’. The cards can be overprinted with Hotel details on the reverse, as well as inside with a message of your choice. We firmly believe that a funeral should be a celebration of a person’s life and the memories that they have created. With this in mind, as well as traditional funeral cards we also supply cards that are a celebration of life. 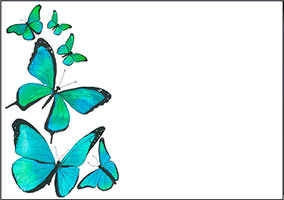 Following a conversation with a Funeral Director who told me that butterflies and dragonflies symbolise new beginnings we have several butterfly and dragonfly cards in the range. I am a mixed media artist with a background in 3-dimensional design. I recently gained a master’s degree in Fine Art. I am passionate about my subject and enjoy designing and painting every design that you see on our web site! Each design you see is printed from an original piece of my handprinted artwork. I understand the florist industry and try to keep our cards up to date with trends, as well as maintaining and improving old favourites. The designs are printed locally here in Berkshire on card from sustainable forests, so you can be sure that helping the environment is at the top of our list of priorities. Our customers tend to stay with us once they have ordered and tend to be the ones that only use quality sundries.